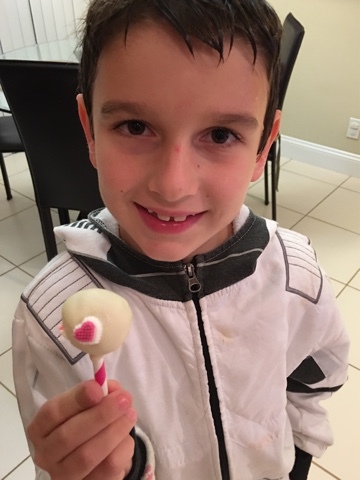 My kids love Starbucks cake pops. Who can blame them? I wanted to try to make them at home, but the whole no baking thing quickly came into play. So I came up with a super easy shortcut to make 5-minute cake pops. That’s it. Start to finish in just 5 minutes. The secret? Doughnut holes. Boom. First, melt your chocolate. I like to use a small drinking glass, since that makes dipping the cake pop much easier. I put chocolate chips in the microwave for about 30 seconds-1 minute until the chips are melted. Then I add a half a teaspoon or so of coconut oil to make it shiny, smooth and super easy to work with. I like using straws for my cake pops since I think they look so pretty. Cut your straws in half and dip one end in the chocolate. Then stick it in the doughnut hole and let it set in the fridge for a few minutes. If you don’t do this your doughnut hole will fall off the straw while you are trying to coat it with chocolate. Which is fine if you want cake balls, but we’re going for cake pops here. Then I have the kids decorate them while I am still holding them, or after I set them into the egg crate. Pop them in the fridge and you are DONE. Chillin’ in my fridge. In an egg crate. 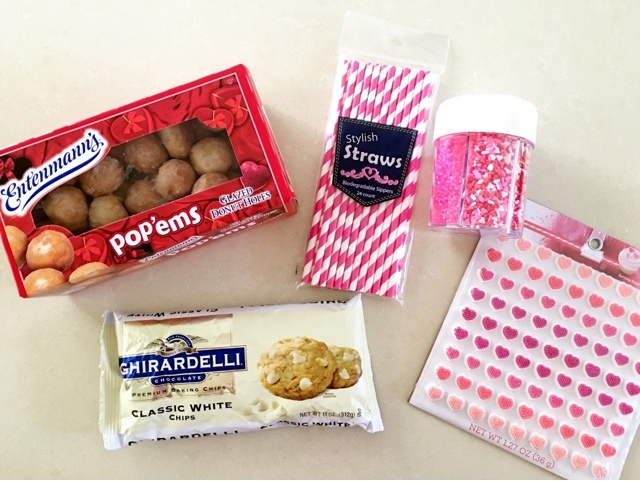 I made these Valentine’s themed, but you can make your cake pops to fit any theme you would like. 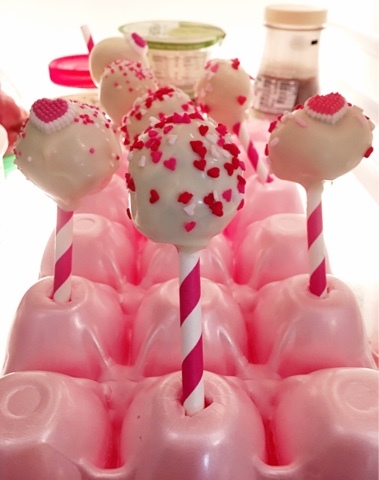 Use colored chocolate, different colored straws, sprinkles… anything you would normally come up with for a cake pop. 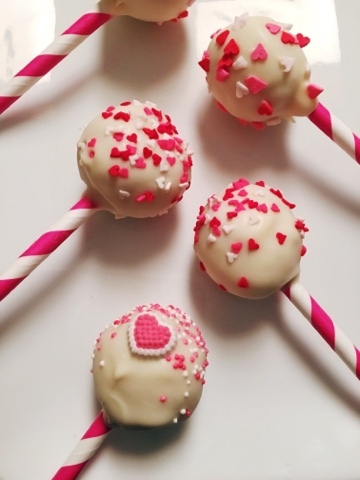 There you go, 5-minute cake pops. If you are looking for another quick and easy treat that could work for Valentine’s Day, be sure to check out my chocolate covered red velvet Oreos! What are your favorite baking shortcuts? I am always looking for new ones! These are brilliant!!! My kids would love these!! And they're so cute too! Thank you! I love a good short cut! This is so smart! I used to make cake pops for my kids at school, but they took FOREVER! I'll have to try this sometime. You will never go back.. these are SO easy! They taste so good too! Best shortcut ever! What a smart idea! The real cake pops are such a pain to make. Honestly I think donut holes taste better too. Pinning & sharing. This is genius! I love making cake pops but they can be so time consuming. 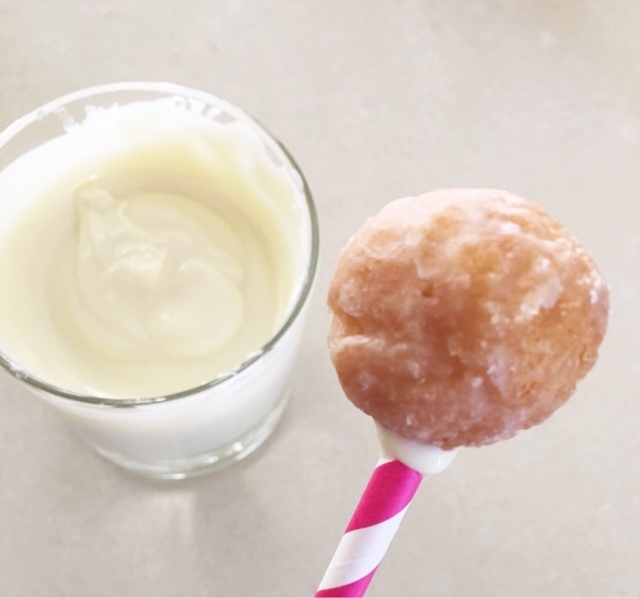 This is a great way to speed up the process, and who doesn't love doughnut holes? Pinning this for sure! Oh my gosh. This is so smart! I'm going to have to use this idea for a wedding favor post!! This is brilliant! I have to make these for my 5 year old! Awesome sauce! Where was this post a few weeks ago when I was looking for the mold to make them?!?!?!? Lol!!!!!! GENIUS!!! I love it…this is something I can def do!! When I saw this post, I immediately was curious as to how it really could only take 5 minutes to make these and the doughnut treats blew my mind! Why have I never thought of this before?! Genius! FIVE minutes? You are my hero!!! BRILLIANT. Best mom baking hack ever! Well done! This is awesome! I LOVE the egg cart idea! Can't wait to try it! All I can say is GENIUS! This is seriously so smart! I love how simple and pretty it is! I'm definitely trying this. Thanks for sharing! Yes!!! This is the best baking hack I've ever read! Pinning/sharing! Okay, how have I never thought of this before. This is brilliant!!!! Yes, please. I am so doing this! Pinned for late. Sammie loves cake pops. Haha your kids look so cute! And, I loved the pops! totally my style! easy, good. i may even use this idea for my sons baseball bday party next month – i'm formulating ideas as we speak! These are amazing!! And so many helpful little hacks here! That is a very clever idea. Love it! These look so fun! Looks like your kiddos enjoyed them! Oh my gosh how simple!!!! 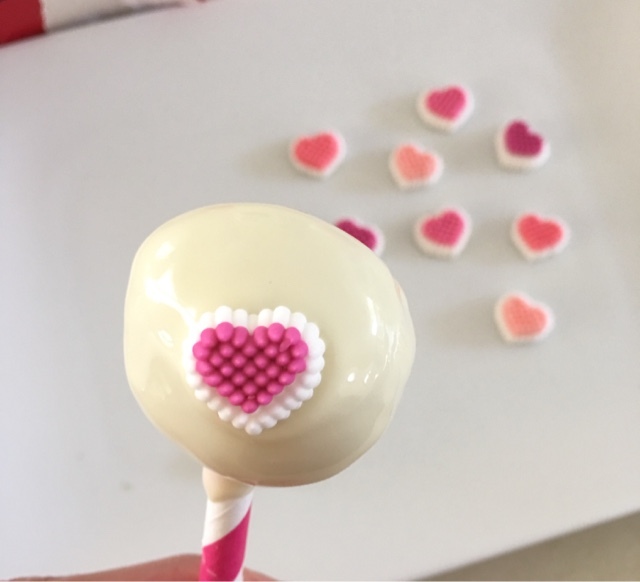 I love cake pops, I think they are adorable and such a nice treat! This makes it so much easier than how they are usually made!!! Great post! Love This! It looks easy, fun and kid friendly. All my favorite things. Omg such a clever idea!!! My daughter would love to make these! Such a great idea! And so simple. They look so pretty and shiny! I have to make these for Valentine's Day. OMG. I wondered how this was made. One of my husband's co-workers whipped some up for our daughter's 2nd birthday. They all loved it. This is genius! 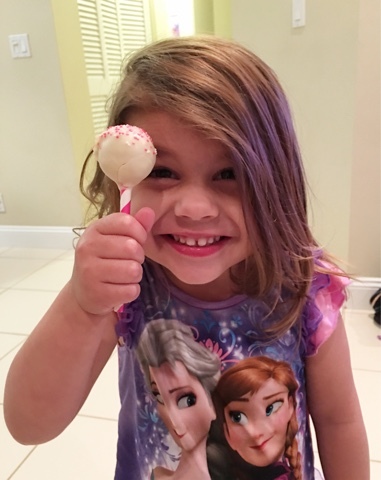 My daughter, also, loves the cake pops at Starbucks. This is a great substitute. We'll be making these for sure!